Instead of floating in the water, Swimtrainer helps your baby to SWIM safely. Your baby can swim safely with Swimtrainer using the breast stroke reflex it has from birth. Swimtrainer is the perfect product to help your baby adapt to water and learn correct leg movements in the early periods. 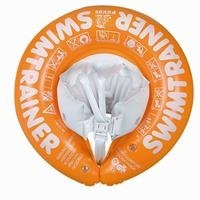 The specially designed Swimtrainer has been structured according to your child's age and ability. Thus, the natural swimming reflexes of the babies are improved at an early era and correct swimming skills are given stage by stage with the help of games. Swimtrainer is made of durable plastic material and its seating parts are inflatable. The practical belt below helps Swimtrainer and the inflatable safety belt to easily and securely lock. Inflatable surface that prevents the child from sliding out of the ideal swimming position. The clips system that enables an easy fit. Adjustable safety belt that prevents the baby from leaning front and falling into water.